NEWSLETTER AND LEGAL UPDATES: FALL 2014 - Fanning Harper Martinson Brandt & Kutchin, P.C. - Fanning Harper Martinson Brandt & Kutchin, P.C. Fanning Harper Martinson Brandt & Kutchin, P.C. is pleased to provide you with our Fall 2014 Newsletter and Legal Update. Below you will find information regarding successes and activities of our attorneys. Please click the hyperlinks for updates regarding Local Government, Constitutional and Civil Rights Law, Products Liability, Employment Law, School Law, Automobile and Trucking Litigation, Premises Liability, Land Use, Zoning, and Regulatory Taking, Insurance Law, and Homeowners Association Law. Please call us with your questions or comments. FHMBK attorneys Don Martinson, Thomas Brandt, and Joshua Kutchin have earned selection to the 2014 edition of Texas Super Lawyers, which recognizes the state’s top attorneys. Earlier this year, Joshua A. Skinner and Francisco J. Valenzuela were selected to the Texas Rising Stars list. FRANK VALENZUELA and NICHOLE PLAGENS obtained a victory on behalf of a non-profit company in a lawsuit filed by a former employee alleging, in part, claims of intentional infliction of emotional distress and negligent supervision. Upon consideration of FHMBK’s motion for partial dismissal, the federal district court dismissed the plaintiff’s claims. FRANK VALENZUELA and NICHOLE PLAGENS obtained a victory on behalf of an automobile dealership before the Equal Employment Opportunity Commission (the “EEOC”) that had issued a Determination finding retaliation. FHMBK submitted a request for reconsideration, including newly developed evidence, showing that the claimant’s termination was not retaliatory. Subsequently, the EEOC issued a Rescission of its prior Determination and issued the claimant a right to sue letter. In the latest quarter, MARC FANNING recently won five Motions for Summary Judgment involving premise liability issues thus avoiding trial, further expense and work up of the cases on behalf of the firm’s retail and grocery store clients. THOMAS P. BRANDT and JOHN D. HUSTED achieved a total victory defending a north Texas city and the city’s police chief against a citizen’s Fourth Amendment unreasonable search and seizure and state law negligence claims. The citizen alleged that she was sexually assaulted by a city police officer and that the assault was the result of police department policies and the police chief’s failure to properly train, supervise or monitor the offending officer. Mr. Brandt and Mr. Husted filed a plea to the jurisdiction, arguing that the City and Chief were immune from the plaintiff’s claims and that her claims were barred by the statute of limitations. In lieu of responding to the plea to the jurisdiction, the plaintiff’s attorney conceded the case at the hearing on the plea. THOMAS P. BRANDT, STEVE HENNINGER, and NICHOLE PLAGENS obtained a victory on behalf of a county in a lawsuit filed by a former employee alleging, in part, claims of color discrimination and gender discrimination, a disparate impact claim, violations of section 1981, and seeking punitive damages. After a hearing on FHMBK’s motion for partial dismissal, the federal district court dismissed the plaintiff’s claims with prejudice. JOSHUA SKINNER and JOHN HUSTED obtained a summary judgment victory in federal court in favor of a community college district in a Title VI discrimination claim brought by a student. The student claimed that the college district operated its financial aid department in a racially discriminatory manner. Upon consideration of FHMBK’s motion for summary judgment, the magistrate judge recommended dismissal of all claims. THOMAS P. BRANDT and JOSHUA SKINNER obtained an appellate victory at the United States Court of Appeals for the Fifth Circuit on behalf of a municipality and an appraisal district. The plaintiff brought suit against the municipality and appraisal district, as well as various other defendants, alleging a wide variety of constitutional and statutory claims based on an underlying real property dispute. THOMAS P. BRANDT, JOSHUA SKINNER and DAVID UPHAM filed an amici brief on the United States Court of Appeals for the Second Circuit in a case out of Connecticut that resulted in a $41 million jury verdict against a school for damages from an alleged insect-borne illness. The amici brief was filed on behalf of The Association of Boarding Schools and the North American Montessori Teachers’ Association, arguing that the judgment against the school violated public policy because it could have the effect of curtailing routine outdoor activities for children around the country. The amici brief is available here. THOMAS P. BRANDT, LAURA O’LEARY, and PAULA WALKER, Executive Director of Special Education for Lewisville Independent School District, spoke at the 2014 TASA/TASB Convention in Dallas on September 26-28. Their presentation addressed bullying and school liability and discussed recent changes in state law regarding bullying, administrative guidance about schools’ responses to bullying, and recent litigation involving claims of bullying. On September 25th, 2014, JOSHUA KUTCHIN presented a seminar in Irving, Texas, to the Horace Mann Insurance company and Teachers’ Insurance Company, entitled Texas Claims Update, intended to inform participants about recent changes in Texas law and to provide TDI- approved continuing education credit for those in attendance. THOMAS P. BRANDT spoke at Texas Municipal League Intergovernmental Risk Pool 2014 Annual Attorney Workshop in Austin, Texas at August 22, 2014. His presentation addressed First Amendment Retaliation. To read his presentation paper, click here. On July 24, 2014, FRANK VALENZUELA appeared as a guest on the “GRN Alive” morning radio show on 910 AM to discuss recent appellate court rulings concerning the Affordable Care Act. 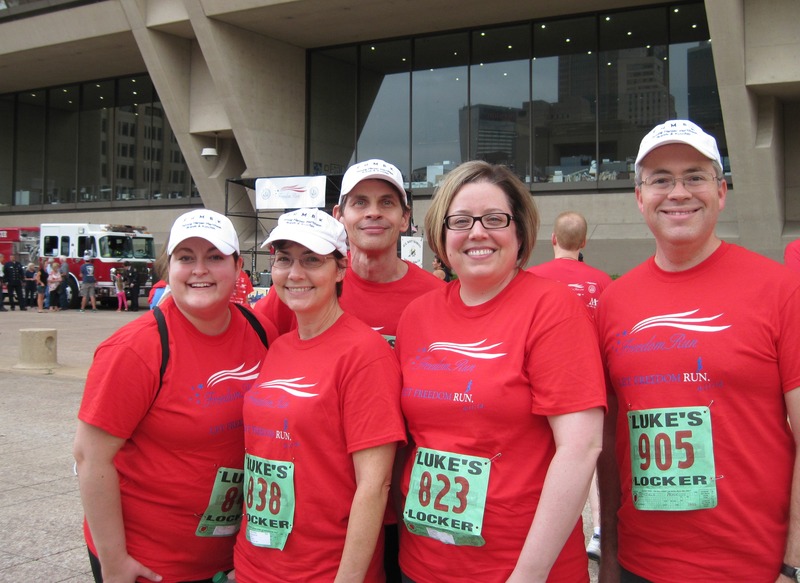 On September 11, 2014, FHMBK attorneys John Roehm, Frank Valenzuela, Jennifer Kelley, Laura O’Leary, and Nichole Plagens took part in the 2014 Freedom Run 5K. After the tragic events of September 11, 2001, the Dallas Association of Young Lawyers organized the Freedom Run as an opportunity to unite and honor the heroes and victims of those tragic events and celebrate those who have sacrificed and continue to sacrifice on a daily basis so that we may enjoy our freedom. Proceeds from the event went to the Assist the Officer Foundation, an organization which provides financial assistance to officers who are facing a loss of income due to a serious injury, life-threatening illness, or other catastrophic event. The Foundation also provides immediate assistance to an officer’s family in the event of the death of an active officer. NICHOLE PLAGENS has been asked by the SMU Dedman School of Law Board of Advocates to coach two mock trial teams that will compete in the American Association for Justice (“AAJ”) National Student Trial Advocacy Competition. One of the purposes of the AAJ is to inspire excellence in trial advocacy through training and education for both law students and practicing attorneys. One way that the AAJ accomplishes this goal is by sponsoring a national student mock trial competition. This year’s Regional Competitions will take place on March 19 -22, 2015, with the winning team having the chance to advance to Nationals, which will take place in April 2015. Additional information about AAJ and the national mock trial competition can be found at: https://www.justice.org/what-we-do/enhance-practice-law/aaj-education/student-trial-advocacy-competition.